There's a reason why there are two buses approaching my stop. Read below! Since starting my new job at ISS, and waiting for my bike to arrive, I have been a bus commuter. I’m not a bus newbie; I spent two years living in New Jersey and commuting by bus into New York city, so I know the ins and outs of it. But like all things in Japan, bus commuting is with a twist. First of all, the bus is always on time. The buses don’t break down and there are few enough accidents that the buses, for the most part, run on schedule. And sometimes, early. Earlier this week I arrived at my bus stop at 7:58am and 30 seconds, to find that my bus, #96, had just closed the door and was pulling away from the curb. It’s supposed to leave at 7:59. The picture above has my bus in the back of the bus that is supposed to arrive and leave before it. What you can’t tell from the photo is that my bus arrived at 7:57am today, at the exact time the #06 is supposed to arrive. My bus stopped short of the actual bus stop and waited. The #06 pulled around it seconds later, loaded up, and left. Only then did my bus pull up to the stop and open its doors. Meanwhile those of us on the curb had to sweat for an extra ninety seconds until 7:58:30 precisely. Note to self: arrive on or before 7:57. Beyond the efficiency factor, there’s the shear breadth of it. On any given major thoroughfare, you’ll find a few buses around. The system is well-marked, easy to figure out, and goes via most major train stations. This city’s infrastructure is bus and train dependent – few people drive. Commuting by bus is cooler than by train by the way – and in a city where temps will reach well into the nineties throughout most of September, cool is crucial. The trains and train stations are all saving electricity due to the March 11th earthquake, but the buses don’t run on electricity; they can be as cool as the driver wants. Oh heck, this is Tokyo – as cool as regulation allows. I see some of the same people every day, as I would in any metro area where I commuted by bus. My favorite is the old lady who wears a printed skirt – and a non-matching print blouse – every single day. Another favorite is the man who looks to be about my age who is with his daughter, who has to be about two years old. The two of them chat and chat. Clearly the dad is off to work, judging from his impeccable suit, and is dropping his child off at the Hoikuen (preschool) near his office. They’re just so sweet together as he juggles her, his work bag and her little diaper bag. There’s another Japanese girl who is probably about ten years old, whose American dad brings her to my bus stop, waits for her to get on, and then heads off to his own work. She gets off at my stop too – there must be a Japanese school nearby. 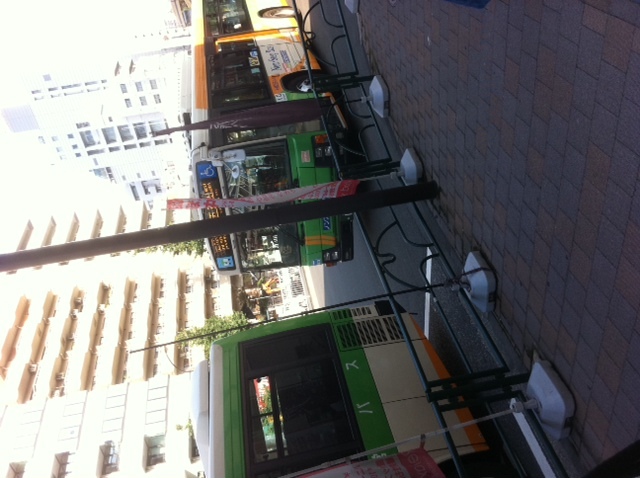 Japanese manners are always different than American manners, and that fact is apparent on the bus. Children are encouraged to sit and women give up seats to men. There’s still an old lady rule – everyone moves for an old lady. But the other day the bus was crowded and a woman got on with her little one and no one gave up a seat. I did, though. That baby looked heavy! The bus is silent. Yep, completely silent. There are reminders to turn phones off completely – they don’t even want ’em to buzz. (I don’t – just put it on silent) No one talks (except the guy with the tiny girl) and no one plays music at any sort of audible level. Complete, utter silence. It’s refreshing. There are some definite downsides, many of them in the summer. Body odor is much less control-able in this heat and humidity. And some Japanese businessmen don’t bathe that often anyway. Deodorant is not as prevalent as it is in the U.S. either. Anyway, the bike arrived today, and we’ll get it in working order this weekend, so my bus days are numbered. But I’m sure if it rains or snows that I’ll hop on the bus again. It’s a great way to move. I am always excited to visit this blog in the evenings.Please churning hold the contents. It is very entertaining.